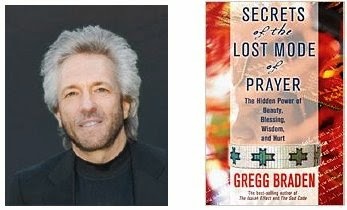 "For more than 20 years, Gregg Braden has searched for evidence of a forgotten form of prayer that was lost to the West following the biblical edits of the early Christian Church. In the 1990s, he found and documented this form of prayer still being used in the remote monasteries f central Tibet. He also found it practiced in sacred rites throughout the high deserts of the American Southwest. In this book, Braden described this ancient form of prayer that has no words or outward expressions. Then, for the first time in print, he leads us on a journey exploring what our most intimate experiences tell us about our deepest beliefs. Through case histories and personal accounts, Braden explores the wisdom of these timeless secrets, and the power that awaits each of us"
"The key to using this lost mode of prayer is to recognize the hidden power of beauty, blessing, wisdom, and pain. Each plays a necessary role as part of a greater cycle that allows us to feel, learn, release, and transcend life's deepest hurts. In the words of an unnamed scribe recording the teachings of Jesus nearly 2,000 years ago, we're reminded that the power to change our world, as well as any obstacles that stand between us and that power, live within us. He simply stated, "The most difficult thing of all [to do as humans] is to think the thoughts of angels...and to do as angels do. Prayer is the language of God and the angels. It's also the language we were given to heal life's suffering with wisdom, beauty, and grace. Whether we learn of prayer's power from the Internet today, or from a first-century parchment scroll, the message is the same. Accepting our ability to use such a universal language may well be the greatest challenge of our lives. At the same time, it is the source of our greatest strength. When we know beyond any doubt that we already speak the feeling language of prayer, we awaken that part of us that can never be stolen, lost, or taken away. This is the secret of the lost mode of prayer." The Real Power behind your prayers is not the words (though they do help). It is based in the silent language of human emotions. God invites us to feel gratitude and appreciation, as if our prayers have already been answered. Through this quality of feeling, the ancients believed that we're given direct access to the power of creation: the Spirit of God. "FEELING IS THE PRAYER"
In the book, he gives a real life example of this mode of prayer working. He visits a native friend in the high deserts of northern New Mexico which had been experiencing severe drought. He had invited Gregg to go with him to "Pray Rain". They hiked for 2 hours to a special place in the desert and his friend showed him how to "Pray Rain". He took his shoes off, closed his eyes, his breathing became slow and his body became motionless. After a few short moments, he took a deep breath and said, "Let's go. Our work is finished here." Gregg was shocked and asked are you going to pray for rain? His friend said "No, I said that would "Pray Rain". If I prayed for rain, it could never happen. Prayers for rain empower the drought. Continuing to ask for these things puts the feeling on the drought and not on the rain." Gregg asks him what actually did he pray...He answers, "I began to have the feeling of what rain feels like. I felt the feeling of rain on my body, and what it feels like to stand with my naked feet in the mud of our village plaza because there has been so much rain. I smelled the smells of rain on the earthen walls in our village, and felt what it feels like to walk through fields of corn chest high because there has been so much rain. I then felt grateful for the opportunity to participate in creation. Through our thanks, we honor all possibilities, while bringing the ones we choose into the world" -- POWERFUL STUFF!!! Fascinating! This is what I've been looking for my whole life! Thanks Gregg!! !